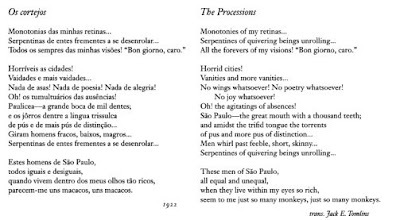 The following poem is by one of my favorite poets, Mário de Andrade (1893-1945), who was also a novelist and short story writer, journalist, pianist and ethnomusicologist, art historian and critic, photographer, and professor, and one of the most important figures in Brazilian Modernism. Indeed, in 1922, he and a group of other notable then-young Brazilian writers inaugurated São Paulo's Week of Modern Art, a watershed event in early 20th century Brazilian culture that also established that city as one of the international capitals of the avant-garde. These days this great queer, mixed-race figure is probably best known for his novel Macunaima (1928), which captured the marvelous syncretism of his native country perhaps better than any other fictional work. Here is one of his poems, in Brazilian and in translation, from Stephen Tapscott's 20th Century Latin American Poetry: An Anthology.